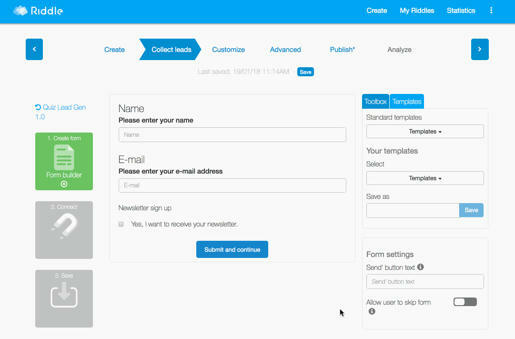 With our Quiz Lead Generation 2.0, our templates let you easily reuse any form you create. Create a form once – then add to any quiz you build. Once your form is perfect, click on the ‘templates’ tab. Type a descriptive name in the ‘save as’ field, then press ‘save’. Want to make this form your default for any future quizzes? We’ve also included some pre-built templates to save you time. Our templates are just a starting point – feel free to customize any fields, then save as your own template. Not a Riddle user yet? Try a free trial – no card needed.